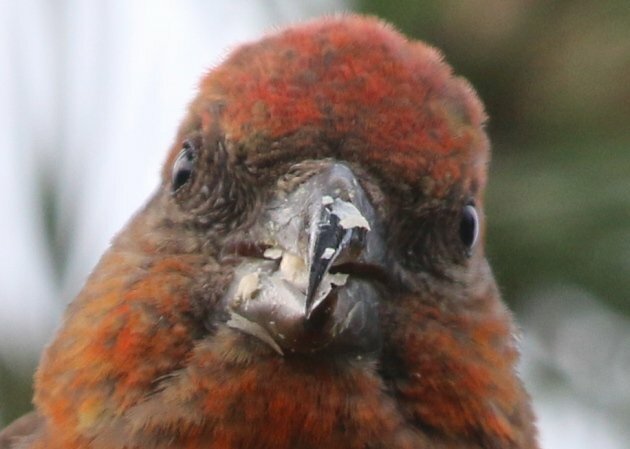 I completely dislike encountering crossbills. They are terribly frustrating birds. The birds themselves I love dearly, but they are a pain to come across out in the field. Because quite frankly, they might just be the worst when it comes to conducting field identifcation. Which is what birding is often, if not mostly, about. When I write about dislike and frustration, I am not talking about the uncertainties of species limits in that particular group, about the different call types and their invasions and what challenges these bring to a birder’s work. 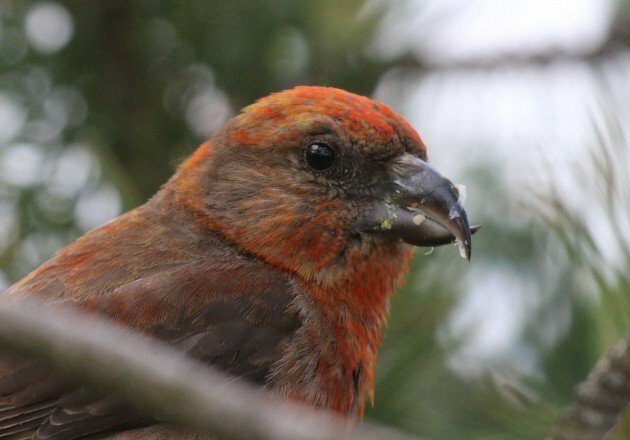 Yes, I fully support any and all efforts of splitting the crossbills into as many species as the call-types may merit, and will proudly call out “the more the merrier!” in any discussion about crossbill taxonomy. I will even go so far as to state that birders should rejoice that calls are the only (near-)definite way of identifying the different forms. Because calls are all we get from them – that’s all they give us. 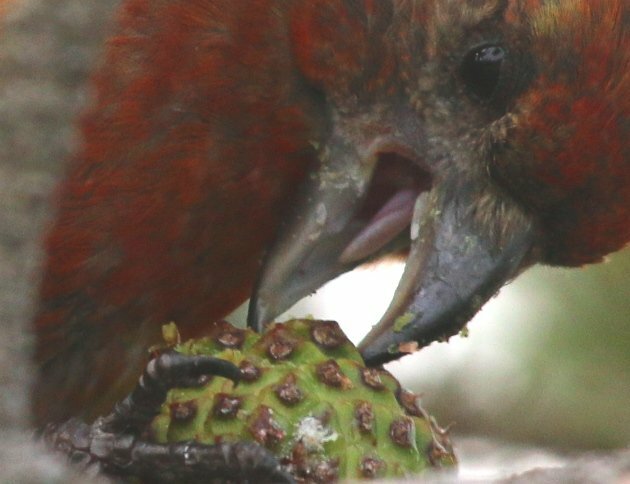 And this is why I dislike encountering crossbills out in the field. 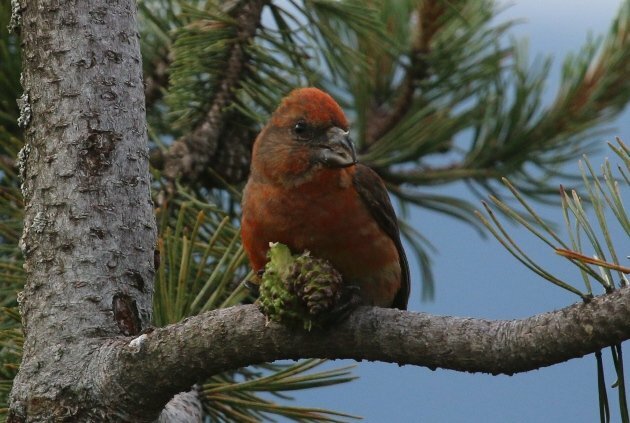 Germany is blessed with a single species of crossbill, the Red Crossbill Loxia recurvirostra. 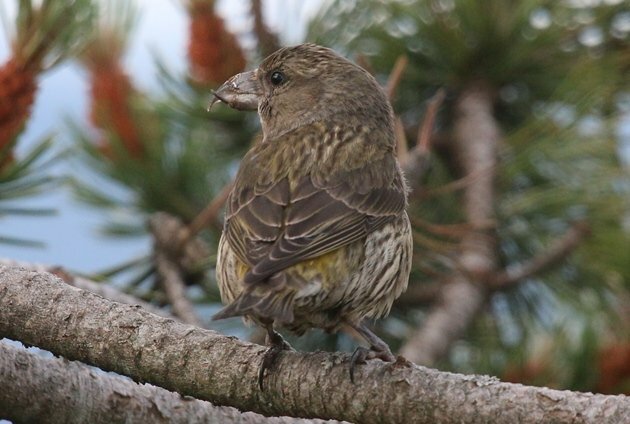 We do get two other species on rare occasions, with Parrot Crossbills from NE Europe usually showing up with a few observations each year and a Two-barred Crossbill (a species some call White-winged) once every couple of years. 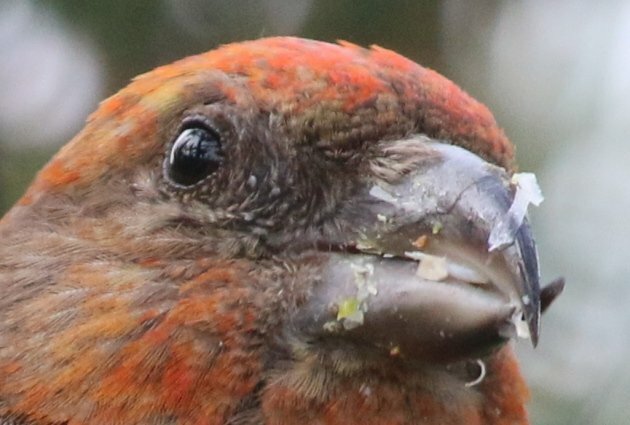 This vagrant potential is the reason why German birders really like to get to know each and every crossbill they encounter thoroughly, up close and personal. 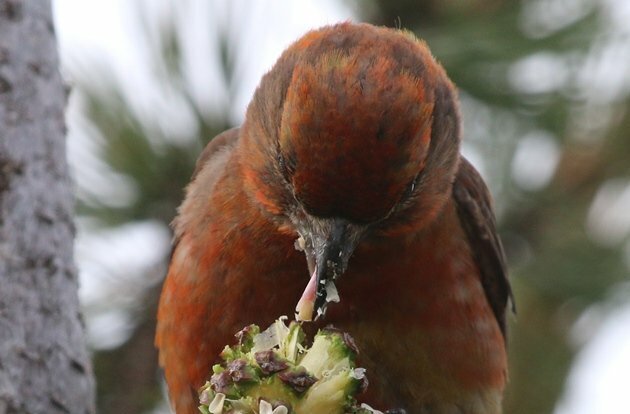 However, the crossbills have a very different idea of how best to associate with birders. While we love to see them perched in front of us, in a lateral view, to study bill shape and dimensions as well as extend and colour of wing bars, they mostly enjoy seeing us as blurry shades of colours somewhere far below amongst the conifers they’re dashing by. You will see that there is very little overlap in our respective interests and ideas. 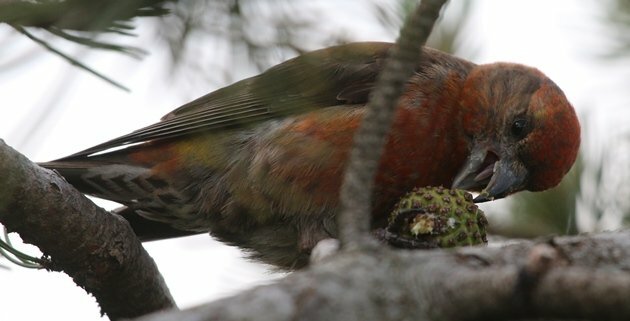 My most common type of encounter with crossbills follows this scheme: I walk through a forest with conifers. I hear calls – gyp gyp. I pause, thinking for a moment because I don’t hear crossbills very frequently. 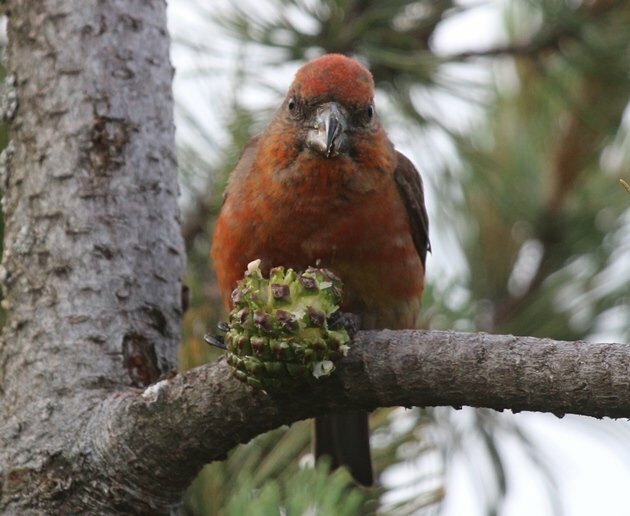 Then it dawns upon me: crossbills! I look up trying to spot the flock. I fail because the tree tops are in the way. The calls fade away. This is probably the case in 50% of my crossbill observations. Another 40% follow the same routine, except that I catch a short glimpse of a couple of dark bodies in flight. The only details I am able to see allow me to exclude bats, model airplanes and US drones, and it is only through their calls that I am able to write down anything in my note book. 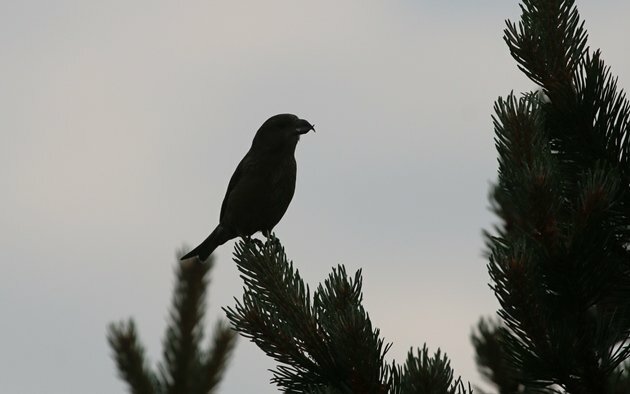 Now, if I am really lucky I will walk through a forest, hear calls, think for a moment, identify them as crossbills, walk towards them and see them perched in a tree top! The distance will be considerable, the light will be bad, the birds will mostly be perched behind branches and the flock will eventually fly off in the opposite direction, out of sight, after 10 seconds or less. On very rare occasions, I’ll be able to discern some colours, mostly green. Sometimes, I will even think that I might have seen some red. But since that is almost too good to be true, I will frequently assign it to wishful thinking. Now our field guides tell us to check their bills: if the bills are rather strong (roughly as high as they are long), and if the tips are crossed but the tip of the lower mandible is not visible behind the upper mandible, and if the lower mandible’s lower edge is strongly bent in an “s”-shape, you may very well have found a vagrant Parrot Crossbill. Now you tell me: in which of the scenarios listed above am I able to check these features? You see, this is why any attempt at identifying crossbills is an exercise in futility. It is pointless, and thus frustrating as each encounter might mean you’ve just missed out on an opportunity to record an amazing vagrant for Germany. Hence my dislike for encountering crossbills in the first place, and my being enamoured with the call-type approach: if you hear calls in the forest, all you have to do is quickly record and then forget about them until you’re home – no need to contemplate crappy viewing conditions and potentially missed vagrants. This is great! Sure, it is not what most birders enjoy doing out in the field, but think about the alternatives: would you rather have to cope with fine plumage differences or bill measurements to identify the different crossbill types? Seriously? I say recorded calls – as boring as I find this as a field method – is the lesser evil. And then something strange happened just recently in the northern Black Forest. I had stopped near the summit “Schliffkopf”, which is one of the Citril Finches‘s last haunts there, in particular to find Citril Finches. I get out of the car, walk around the hotel to the track where Citril Finches are sometimes found, and hear a call. I check the sky to no avail and then notice a shape on top of a small pine. By the barrel of Barrow, a perched crossbill, so close I can even discern its crossed bill tips! Thankfully in bad light or my entire world view would have been turned upside down. Best. Crossbill. Ever. Luckily a rather drab juvenile and not a splendid adult male, or my entire world view would have… and so on. 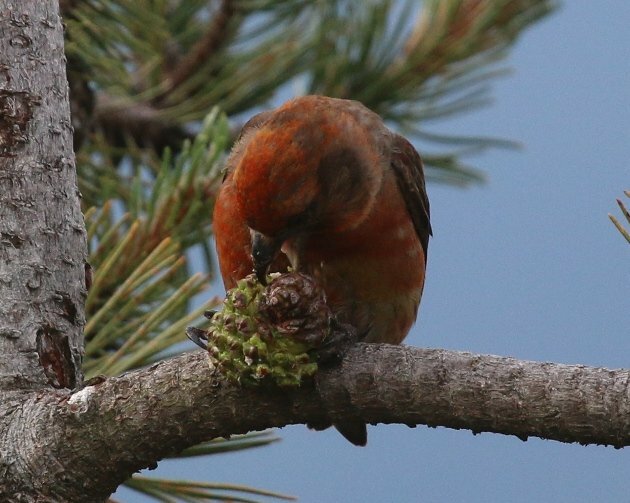 A male – male – MALE – Red Crossbill taking a pine cone apart! A quick check. That nerd ain’t dangerous. …but is out-competed by the male, even after it moves to a less than ideal branch. By the time the images above were taken, I was so close that a better pair of binoculars would have allowed me to directly read the bird’s genetic sequence to confirm its identification as a Red and not Parrot Crossbill. Luckily the bill shape left no room whatsoever to speculate in the direction of the rarity, so I was not hampered by my binocular’s inability to penetrate the nuclear membrane. You may argue now that I should reconsider my opinion on crossbill encounters. And you may be right. But then again, this exception to the rule may just be a feint to see me fall into even deeper despair at my next hearing but not seeing them in forests that are as dark and deep as the humour of the birding gods. @Rick: Ha! 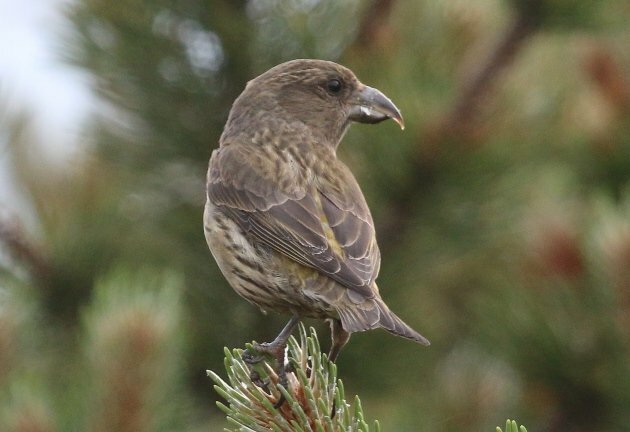 I am not sure what such an approach would do to my reputation here in Germany, but will make it one of my life’s goals to find Germany’s first Scottish Crossbill! Thank you… those are truly amazing photos! I’ve been birding for several years now, and have always wanted to see a crossbill. Your photos are almost as good as the real thing! Thanks, Wendy! And good luck finding a crossbill!! I do hope you get to see one nicely, they are such charismatic birds! Thanks, Clare! I am not entirely sure I will ever fully understand what happened last night (7:1 !!??? ), but it was just amazing to watch them play. Fingers crossed they win the cup!!! They are wonderful birds. This is what makes seeing them only badly so frustrating, and seeing them nicely such a special treat. @Jane Wilson: Thanks! And yes, indeed, this was a very, very special moment.